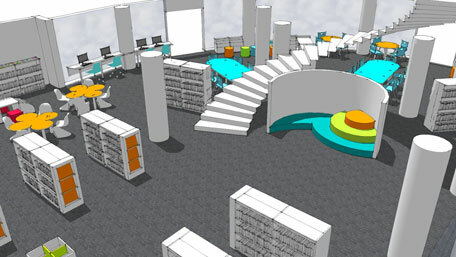 The library for Stage One (Years 1 – 6) was completed first and consists of a bright, modern space blending the very latest thinking and practice in library design and furnishings for educational spaces. An important part of the design brief was to focus on creating innovative spaces. This is in line with Shaikh Mansour’s announcement that school-governing bodies will, in future, use innovation as a criterion to evaluate the performance of Dubai schools. Demco’s design team created bespoke shelving, IT benching workstations and amphitheatre style seating which is very popular in UK schools. The high white gloss finish of the shelving looks bright and fresh and is offset with spots of colour via the seating, tables, end panels and chairs. 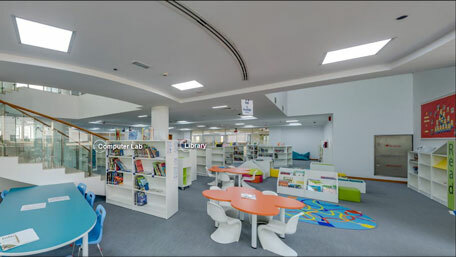 The area offers spaces for all different types of activities and learning, from quiet zones to large tables for group working or for students to spread out, kinderboxes provide storage for large reading books for younger students and the white shelving carries fiction and nonfiction stock. A striking glass stairway spirals upwards and leads straight into the second school area. Demco continued the same theme of brilliant white bespoke shelving throughout the L shaped space. For added flexibility the shelving is on castors, making it easy to move and create different spaces for a range of activities. The adult furnishings for older students carry a very British theme of red, white and blue and are used to break up areas and give students spaces to hang out, chat or work from laptops and tablets. Funky soft seating in bright blue is located around café-style white tables so that students can work in small groups. The two projects took place over a two year period. The first phase of students entered the school in September 2015 and the Secondary School is ready to take the first phase of older students from September 2016. To get to the library, go to the Main Entrance, then Reception. Once in the building scroll back or expand the image to see the Library Entrance on the next level.